Federal transportation aid programs often create perverse incentives for states and metropolitan areas. The worst incentives are created by discretionary funds that encourage state and local governments to adopt wasteful programs in order to get the largest possible share of those funds. For example, instead of encouraging cities and transit agencies to spend funds efficiently, the New Starts capital grants program encourages them to build the most expensive projects. By building a wildly expensive rail transit system, for example, Salt Lake City has collected $2.17 in federal funds per transit rider over the last 22 years. In comparison, by focusing exclusively on buses, Milwaukee has collected only 26 cents per transit rider. – A 2.3-mile extension of an existing line in Denver is expected to cost nearly $100 million. – In Seattle, a 3.3-mile route is expected to cost $628 million. – In the 1980’s. heavy-rail lines built in Atlanta, Baltimore, Miami and Washington cost an average of $140 million per mile (about $265 million in today’s dollars.) In 2016, however, the expected cost is $340 million per mile. Such expensive projects not only waste federal transportation dollars, they impose huge burdens on local taxpayers. As a result, far from promoting urban growth, regions that build rail transit end up growing slower than ones that do not. To fix these problems, Congress should convert the New Starts and other discretionary funds to formula funds. 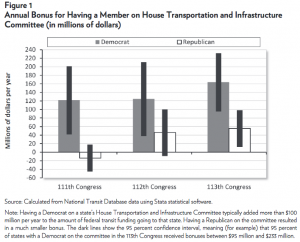 To encourage states and regions to build transportation systems that respond to user needs, Congress should incorporate user fees into the formulas.